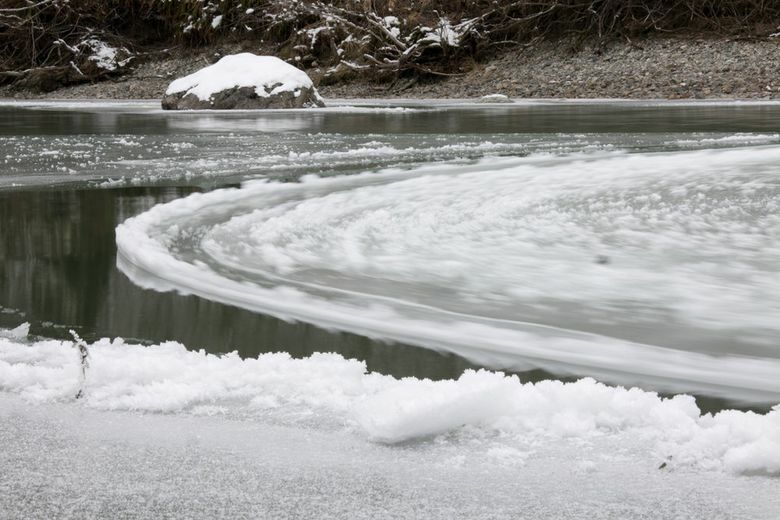 The ice circle might have been formed by a "corkscrew motion" caused by melting ice and a slow current. 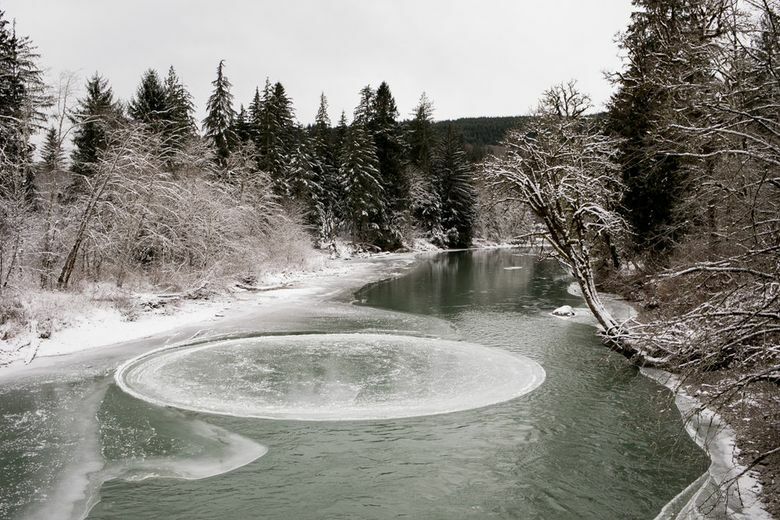 An ice circle that formed over the weekend in the Middle Fork Snoqualmie river was a curiosity not only to those who photographed it, but to scientists fascinated by the phenomenon. Montgomery said there are two ways he believes the ice circle could have formed. Sometimes, he said, ice circles form at bends of a river as eddies push floating ice against a spin at the river’s bank, Montgomery said. But they have formed on straight stretches of water, too. Montgomery thinks that is likely due to a corkscrew-like force on the ice, which is caused by melting ice and the current. Ice, he said, melts from the bottom. That melting water is more dense than the ice and sinks. When the downward force of the melt is combined with the force of the stream’s current, it creates torque on the bottom of the ice sheet, Montgomery said. That causes the ice sheet to crack and turn and break. Then, “that combination would start grinding the plate of ice past its neighbors, and if you shear off the burrs and you’re close to that shape (a circle), you’ve got minimal friction and it will just spin,” Montgomery said. Montgomery said he was pleased to see the ice circle capturing public attention.